If you ever ask Bobby what his favorite ______ is, he will say “free” for his answer. When we were first dating (although I think I was the only one who knew that was happening) we bonded over our love of plants. We were both excited to realize we had doubles of a lot of books, sharing interests in things like Foxfire, Euell Gibbons, and natural history. Our interests have led us to a lot of experiences that are exciting to us, but not to everyone. For example, it’s really fun for us to forage, and not just because it’s “free” food. We get to go walking through the woods, see lots of cool things, and find plants and animals (or remnants) that we wouldn’t normally see. We once stumbled onto our best chanterelle spot to date completely by accident. Let me tell you, those were the best sloppy joe sandwiches ever! 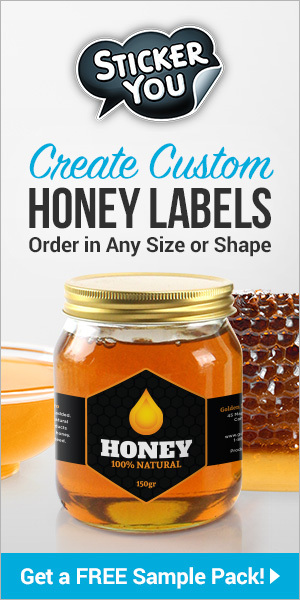 Besides having the bees to produce honey, it is kinda cool to be able to augment your meals with self-sourced food. It can also be a completely different flavor profile than what you can buy, and it’s satisfying to add some things in a non-conventional manner. I also like the hunting aspect of searching for hidden things and being able to find them. Recently, we’ve been running wild in the woods hunting down morels. I was surprised to see how many of my friends didn’t know what morels were. For those of you who have not had the pleasure of being enlightened to the awesomeness that is the morel, it is a mushroom that pops out with night temperatures in the 40s and day temps in the 60s. It’s usually the first mushroom out, and it is highly sought after by foraging aficionados across the world. Most people consider it to be the best tasting mushroom out there, while also being distinct enough to safely identify it. We’ve had some that were as small as a joint in your finger, and some the size of a hand. There’s a few different species available in the U.S. but they can be found in other countries as well. A morel hiding in plain sight. 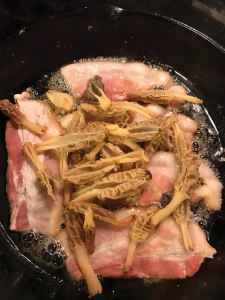 Now that you are SO excited and ready to go eat morels, where do you start? Based on information from some of our books, some websites, and our own personal experience, I can give you some details on how you can go find your own mushrooms. Up front, you need to know that nobody will tell you where their mushroom hunting spots are. It doesn’t matter if it’s your best friend, your cousin, or your co-worker, they will keep that under lock and key. You might think that you would be less of a threat since you’re a newbie, but you would be a potential future threat once you have a taste of delicious morels. You can pay people to take you out and give you advice, but be prepared to pay dearly for it. An important part of any foraging is being prepared. Have your sunscreen and bug spray on, good hiking boots with socks that don’t give you blisters, comfortable pants, and a long-sleeved shirt if you are predisposed to walking into poison ivy or branches (I do both. Often). A hat is not a bad idea, and maybe a walking stick. At least one of us usually has a gun, although that’s mostly because we have a huge population of coyotes in the area. It’s good to have a phone with you at all times in case of emergencies, but also to take photos of your spots to find patterns in where you see morels. A pocket knife is useful for some people to cut the mushrooms, although I’m usually too impatient for that. You also need something to carry your bounty in, which should be a mesh bag. One of the biggest reasons for declining morels is that foragers are collecting them in bags or buckets and the spores aren’t able to fall to the ground. 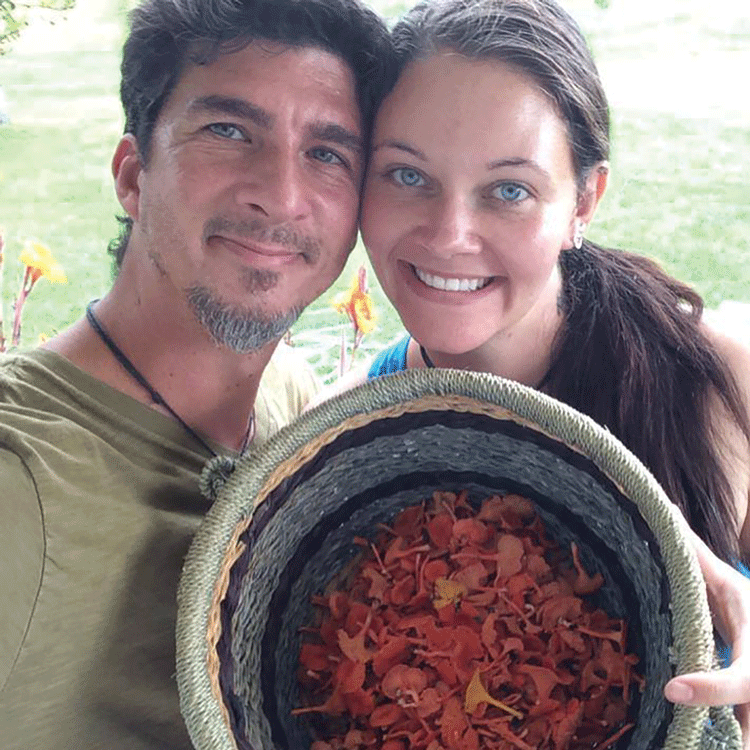 Some people reuse orange bags, or buy specific mushroom hunting bags. We use lingerie bags for the washing machine and a carabiner to hook it to a belt loop. It’s a little abrasive on the mushrooms, but not so much to make a difference. Morels are only really around in the springtime each year. Based on the massive hauls on my social media feeds, I’d say that Indiana and Minnesota are the biggest hotspots in the U.S. of people who also post online. Some of these people are covering their truck beds with their morels. I’ve never seen anything like that in NC, but I’m hoping to find that one day. The first thing you need to do is understand what the general season is in your area. 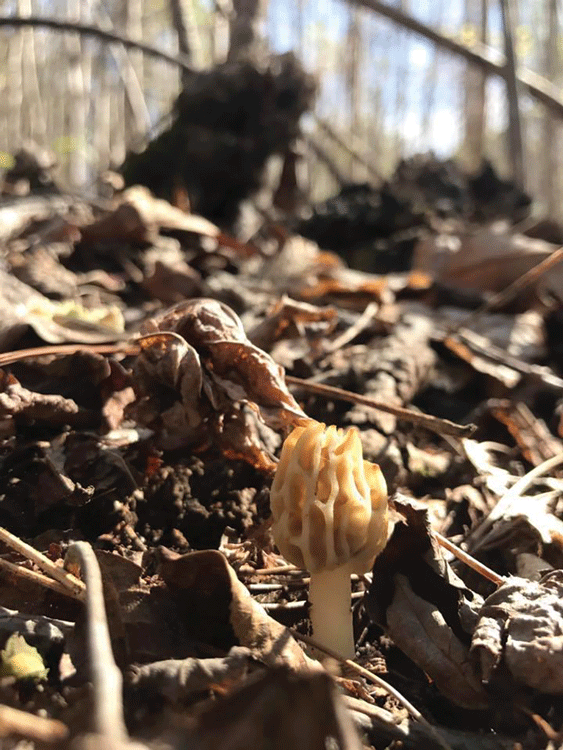 It’s different in every climate, and won’t be quite the same from year to year, but the rule of thumb is looking for morels once the temperatures don’t drop below 40 at night and you have a few good rains. It doesn’t have to get particularly warm, or be sunny for them to grow, but they do need rain and a somewhat thawed ground to emerge. They come in a few different colors and sizes, but most of them will be the length of your finger or smaller. The last species that emerges can be fairly large, but they are easier to see and you might have some competition finding them. For the most part, they are yellowish, or whitish-yellow with a gray honeycomb cap. Since these are the fruiting bodies, it’s a good idea to look around the area once you find one because the spores that created that one should have been able to successfully reproduce in other places nearby. These sorts of areas are likely to be in an old ravine or creek bed where rain runoff has spread the spores downhill. Most of the time you’ll find several in one spot. A potentially sunny south-ish facing slope will likely be the first place you will find them because it heats up a bit faster. They usually can be found near hardwood trees in the woods where there’s enough space in the canopy for light. Elms and Sycamores are fan favorites to identify a good hunting spot, but we’ve had all of our success near tulip poplars here. That doesn’t mean we’ve found morels at every tulip poplar, but all the morels we’ve found were pretty close to them. Decaying trees are also a great place to look, but only if the bark hasn’t completely fallen off the trunk yet. Stumps and such can also feed mushrooms. One of our better places has the unfortunate side effect that there are sweet gum spikes, balls from the sycamores, catkins, and dried tulips from the poplars all over the ground. I promise you, all of these can easily be mistaken for a mushroom. They do help point out the types of trees to look for in the woods as good foraging spots. Although it’s pretty easy to tell a morel because of the honeycomb-like pattern in the cap and completely hollow interior, there are some imposters out there. If you’re truly not sure, don’t eat it. The side effects can be pretty nasty if you eat the wrong mushroom, although most mushrooms raw are not so good for you. Keep a watch out for the false morel and the beefsteak mushroom. False morels look somewhat similar, but they are not hollow on the inside and it looks more fibrous through the stalk. I don’t really think they look that similar, but they do look a bit like one of the species of morels that is edible. The beefsteak mushroom looks like a dried brain on a stem, and not really at all like a morel to me. These imposter mushrooms can cause dizziness, nausea, stomach cramps, and a few other nasty side effects if you eat them. I can’t honestly imagine that it would be easy to confuse them, but please take the time to buy a few good mushroom books and check up on the morel websites to get a good visual of the mushrooms that might be out while you are foraging. Morel mushrooms cleaned and cut in half. When you bring them home, make sure you wash them out in a bowl of water. They are hollow, after all, and lots of things think they make great houses. You don’t want to eat those slugs and beetles. When you finish washing them, try to dump the water in a place that might be productive for spores. It doesn’t mean morels will come up in that area, but you might get lucky. Cooking them is not at all difficult either. My favorite is to fry them with bacon. You can’t go wrong with bacon! Sometimes, they taste a little like popcorn shrimp or better-than-normal clam strips when they are battered and fried. They are also great in pasta dishes, like a nice shrimp alfredo with morels. A lot of people will go turkey hunt and come home with morels because they are about the same season. You can always cook up your turkey breast with morels and some nice foraged greens for a wild meal. 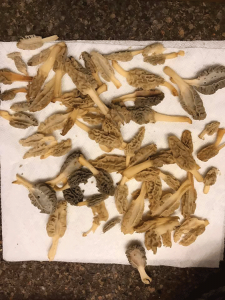 I hope everyone gets a chance to go out in the woods and see what they can find. 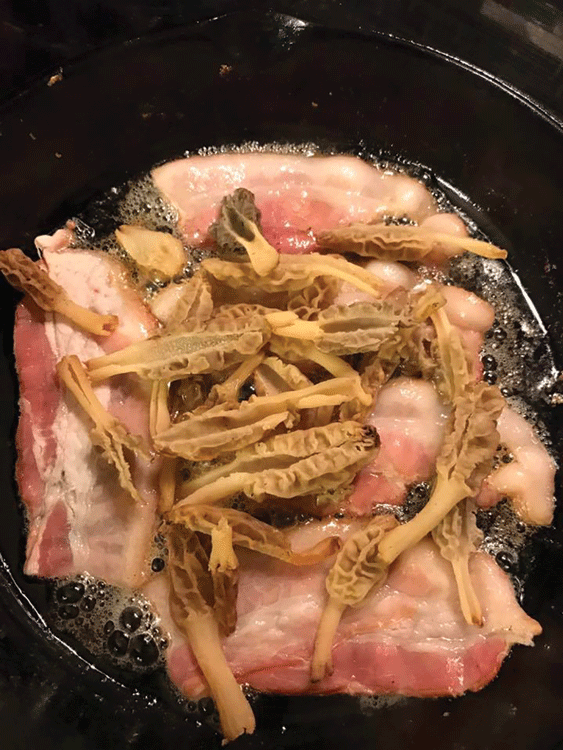 Even if you miss the morel season, there’s still other edible mushrooms if you can learn enough to find the tasty ones (like the chanterelles) and avoid the toxic ones. Make sure you take pictures to make your friends jealous of your foraging prowess! 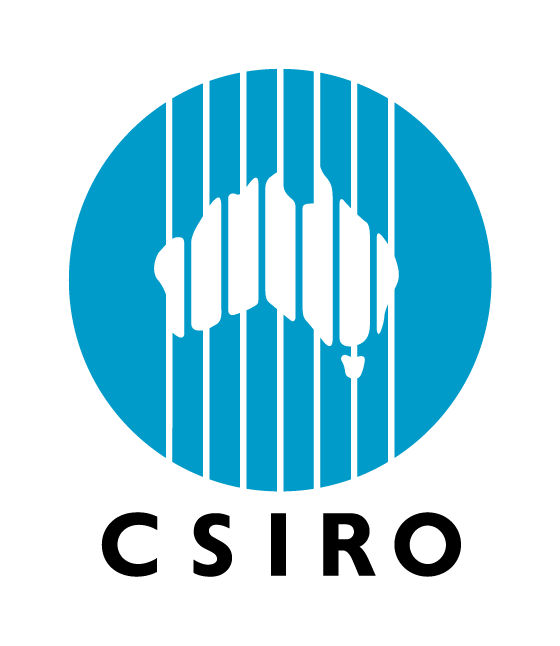 CATCH THE BUZZ – Slovenia To Get State And Tuition Funded Beekeeping Academy.